The unique action of the Grass Stitcher's wheels creates the perfect seed-germination environment. 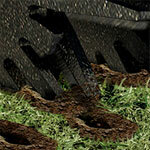 The stubby support arm creates a unique hole, spreading the soil wide so grass seed can easily find its way in. Angled tines push the earth, causing a mound of loose soil ready to crumble and cover seeds when watereed. 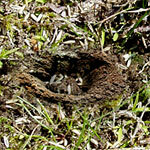 Use organic fertilizers to feed the living organisms in the soil, so grass plant gain full benefit from the soil. Test your soil's pH. Lawn grasses like to grow in a neutral pH. Mow your lawn high to crowd out weed seeds and grow a deeper root structure. Keep your lawn dense and thick with the Grass Stitcher to crowd out weed seeds. It's the revolutionary Grass Stitcher, a simple tool that lets you inexpensively repair bare spots in your lawn quickly and easily. Perforate the troubled spot directly through the dead grass with the Grass Stitcher, leaving the dead grass in place. Then you spread seed over the perforations and water. The Grass Stitcher's two modes of action - one for hard ground, one for soft - lets you get the job done anywhere. The Grass Stitcher's efficient design easily transfers the needed force from leg power or body weight to reach the proper planting depth every time. The sturdy Grass Stitcher delivers a return on your investment every time you use it. Your only other expense is seed and starter fertilizer. This makes the Grass Stitcher much less expensive than any other method. As you can see from the cost comparison chart, it doesn't take long to get a return on your investment in the Grass Stitcher. When you look at the real cost of those other ways to repair your lawn the Grass Stitcher is an outstanding value. In fact, your Grass Stitcher will pay for itself after the second lawn repair, which makes it the least expensive and easiest method for repairing your lawn. So stop wasting your money and time on quick lawn gimmicks or heavy processes. With the Grass Stitcher, you just stitch, seed, sprinkle and save. The Grass Stitcher's two modes of action - one for hard ground, one for soft - lets you get the job done anywhere. Apply downward pressure to the wheels using either body weight with the horizontal handle or the footpad while rocking the wheel back and forth over the damaged lawn area. Make sure not to extend the Grass Stitcher too far out in front of you as this will make it difficult to use and decrease critical planting depth. Use small concise strokes back and forth no more than 12 inches per stroke for best results. If the soil is hard, slide up the horizontal handle and use the footpad to apply pressure while rocking the wheels back and forth with your leg. If the soil is soft, slide down the horizontal handle applying body weight to the horizontal handle while rocking the wheels back and forth for even quicker repairs. Never again use chemicals to address insects and diseases in your lawn. Repair your pest- or disease-damaged lawn quickly, effectively and inexpensively with the Grass Stitcher. Many lawn pesticides are applied to prevent damage from insects or diseases because it has always been considered either too expensive or time consuming to take the risk of not applying them. The revolutionary Grass Stitcher has changed all that. 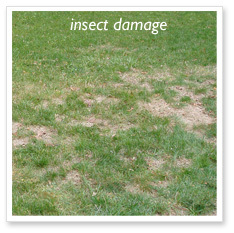 No matter what damage occurs, the Grass Stitcher makes it easy to fix, with little cost and no harm to the environment. 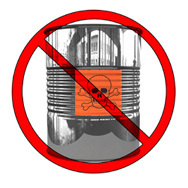 So stop spreading those expensive, potentially harmful chemicals. Just stitch, seed and sprinkle when there's lawn damage. There's no need to spread potentially harmful insecticides when it's quick, easy and inexpensive to fix lawn damage if it occurs with the Grass Stitcher. Now you don't have to spread potentially harmful chemicals on your lawn to protect against grubs and other pests. Keep your environment and your family healthy and save money by using the Grass Stitcher. If damage does occur, just use the Grass Stitcher to quickly and easily repair any trouble spots. Eliminate those unsightly pet-urine-damaged areas quickly and easily with the Grass Stitcher. Dog urine damages lawns because it contains high levels of ammonia, which contains nitrogen, an ingredient found in common lawn fertilizers. A high concentration of it burns the grass. The key to repairing a pet-damaged area is to disperse the excess nitrogen so seeds can germinate. That's exactly what the Grass Stitcher does. First, water the area well to wash out nitrogen, and then use the Grass Stitcher to prepare for seeding and to crumble the soil, allowing oxygen to penetrate and dissipate the nitrogen further. Then spread seed, keep moist and watch your lawn grow back. Just stitch, seed and sprinkle, and those bare spots disappear. Plant alternative ground covers or wildflowers from seed in no time, with the handy Grass Stitcher. Just stitch, seed and sprinkle! Maybe you would rather grow something colorful along that rear border or that problem spot below that tree. Use the Grass Stitcher to plant your favorite plants. Just stitch, spread your favorite flower seed and sprinkle. Then watch your yard transform into a colorful retreat. Shipping for the Grass Stitcher is $14 per unit. The Grass Stitcher includes a full lifetime warranty.